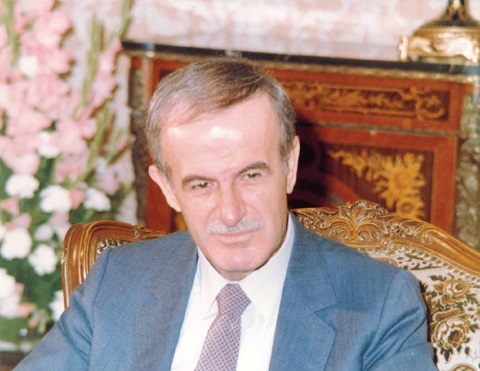 DAMASCUS, (ST)- H.E. 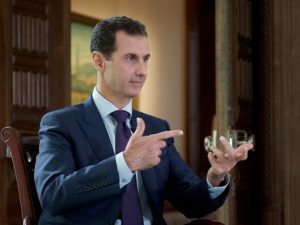 President Bashar Al-Assad has affirmed that the European Peoples are not Syria's enemies, stressing the big difference between the peoples of the European countries and the policies pursued by their governments. 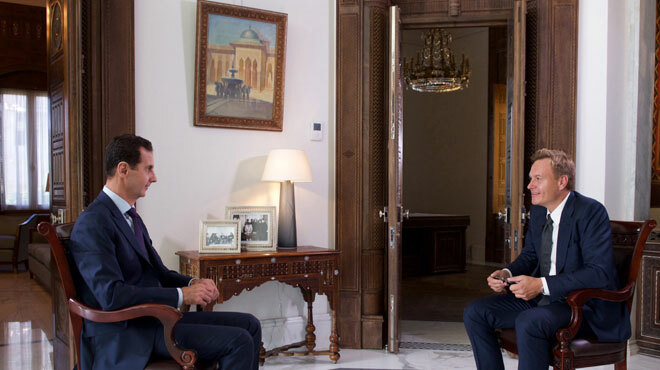 In an interview with the Danish TV2, President Al-Assad said that Europe as a whole has been absent from the political scene at least since Iraq's invasion in 2003, just because it has had to follow the US policy. European governments don't even dare to adopt their own independent path in politics, the President added. On media lies and claims about developments in the Eastern part of Aleppo, President Al-Assad rejected such claims, affirming that the Syrian government never gives orders to destroy hospitals and schools or to kill civilians. This is absolutely untrue as it goes against the government's interests, according to President Al-Assad. "We don't do this even if we put morals aside, because it harms our interests," President Al-Assad said, without denying that individual mistakes can be made during wars. 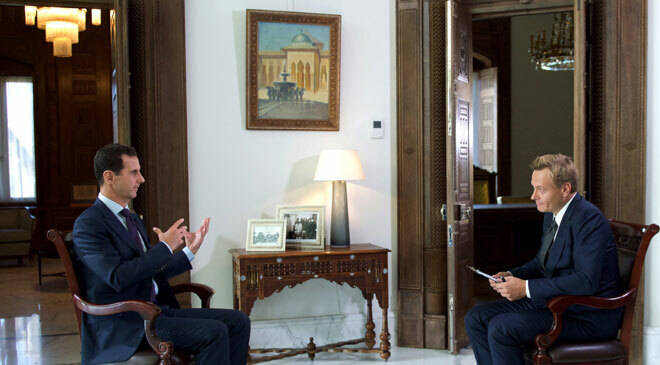 President Al-Assad pointed out that "because we are defending the Syrians we enjoy support as a president and as a government," stressing that this refutes media claims against the Syrian government. Question 1: So, Mr. President, let us begin with the current situation in Aleppo. The last few weeks, terrifying pictures have come out from Aleppo. I mean, we see the residents of the rebel-held eastern part of Aleppo in a very dire situation. They seem exhausted, they seem terrified, the situation is very violent. What is the strategy behind launching such fierce attack from the Syrian and Russian armies at the moment? President Assad: Actually, we didn’t launch an attack, because the Syrian Army has continued its drive toward liberating every part of Syria including Aleppo or eastern Aleppo from the terrorists, but there was a ceasefire for one week in order to give the treaty, or the agreement, let’s say, between the Russians and the Americans a way to be implemented, and it didn’t work. When that week ended, we continued our drive as army to liberate eastern Aleppo from the terrorists. But actually, when you want to talk about the dire situation in eastern Aleppo, it’s not because of the government; it’s because of the terrorists. They’ve been in that area for years now, but we only heard about that “dire situation” in the media recently, in the Western media, because the situation of the terrorists is very bad. This is the only reason. While if you want to talk about the situation there, we never prevented any medical supply or food supply or any other thing from entering east Aleppo. There’s no embargo, if that’s what you mean, there’s no embargo, and our role as a government is to encircle the terrorists in order to liberate every part of the city. Question 2: But what I also mean, we see pictures of children being killed, children at hospitals, we see pictures of demolished hospitals. Who’s targeting those hospitals? President Assad: Let me tell you something about those pictures of children; of course, in every war, there are victims, there are innocent victims, and that’s why every war is a bad war, but if you look at those pictures that they’ve been promoted as pictures in the Western media, they only singled out a few pictures of children that suit their political agenda, just to accuse the Syrian government, while – you’ve been here now for two days – and they’ve been daily shelling from the eastern part of Aleppo toward the rest of the city, and there was wholesale killing and destruction of the other part of the city and tens of victims and tens of wounded people from Aleppo that the Western corporations didn’t talk about them. The Western officials didn’t issue a single statement regarding those children and women and elderly and innocents in general. So, this is part of the propaganda and demonization of the government in Syria. That doesn’t mean when you have war, again, that you don’t have victims, but the Syrian government has opened the door for the militants in the eastern part of Aleppo to leave safely with guarantees, and for the people of that area to go back to their houses. Question 3: But residents in the area, eyewitnesses, international aid organizations, all saying that the hospitals have been targeted, and when I look at the pictures, I see hospitals, I see the beds inside the hospitals, and to me it really looks like it is demolished, it has been targeted, so who’s targeting the hospitals? Question 4: But pictures are facts. 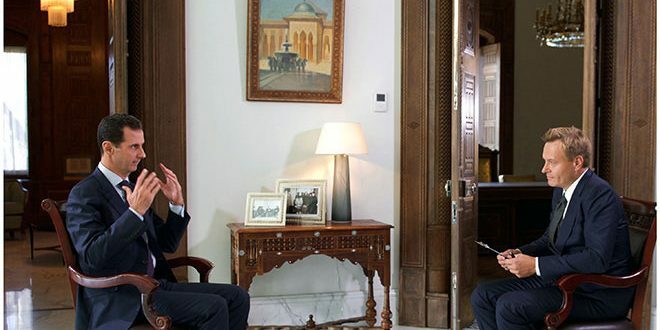 President Assad: Pictures cannot tell you the story, even videos, everything could be manipulated these days. I wouldn’t say that there are no such attacks on any building, but as a government, we don’t have a policy to destroy hospitals or schools or any such facility for a simple reason: first of all, morally, the second reason is that if we do so, we are offering the militants the incubator, the social incubator that they’ve been looking for, it’s going to be a gift, something we wouldn’t do because it’s against our interests. It’s like shooting ourselves in the foot. If there’s such an attack from the army, it could be by mistake, but we don’t have any information that thing has happened. All what we have is allegations and only in the Western media, not from Syria. Question 5: So, if the Syrian Army didn’t attack hospitals, or maybe they did by mistake, you say, are you sure it’s not the Russian air force who are targeting hospitals? President Assad: The question that you should ask when you have a crime: who is the beneficiary of that crime? What would they get, I mean for the Russians or the Syrians, if they attack a school or if they attack hospital? What would they get if they attack a hospital? Nothing, they wouldn’t get anything. I mean, even if you want to talk about the terrorists, most of their hospitals for the militants would be in the basement in ordinary buildings. So, attacking a hospital intentionally by the army is based on shaky logic, let’s say. Question 6: Do you then agree that whoever attacks hospitals, they are guilty of war crimes? President Assad: Of course, by international law, it is. I mean, hospitals have immunity. Any other facility for any inhabited area – inhabited by civilians, not by militants – has immunity, and any government shouldn’t do it, of course, I agree with you. Question 7: Mr. President, you have kids yourself, and I’m sure you’re also watching television, you also watch these pictures of children at the hospitals, children being buried in the rubble. How does it affect you when you look at these pictures of Syrian children? President Assad: Of course, I have children, I have the same feelings of any father and mother who would care a lot about their children, and how would they feel if they lose a member of their family. And by the way, we lost members of our families during the conflict because of the terrorist attacks. But when you look at those killed children, you think why? Why the terrorists did so? Why did Qatar and Saudi Arabia and Turkey commit those crimes? And I wonder why would the Western countries, mainly the USA and its allies in Europe, have supported those terrorists who’ve been committing crimes in Syria? That’s the first thing I thought about. Of course, as President, the second thing that I would think about is how can I protect the Syrian people and the Syrian children, and how can I protect the innocent from having the same fate in any coming day. Question 8: So, you are blaming the rebels in the eastern part of Aleppo of being behind the attacks on the children of Aleppo? President Assad: You can take your camera to Aleppo, to the other part of Aleppo which is under the control of the government, which is – I mean, when you see the fact, it’s more credible than what I’m going to say – but you can see how many civilians have been killed during the last two months in Aleppo. Hundreds of civilians have been killed by the 'rebels'. The question is why didn’t we hear about them in the Western media? That’s my question. Again, I wouldn’t say that you don’t having civilians going as victims, but when it’s shelled by mortars by the rebels intentionally, we have to talk about this crime as well. Question 9: At the moment, there’s a seven-year-old girl, her name is Bana al-Abed, from Aleppo. She’s Tweeting about her life in the eastern part of Aleppo. She’s talking about the massive bombardment. She’s very scared, every time she wakes up and realizes, fortunately, she’s still alive. Do you trust her as an eyewitness? President Assad: You cannot build your political position or stand, let’s say, according to a video promoted by the terrorists or their supporters. It’s a game now, a game of propaganda, it’s a game of media. You can see anything, and you can be sympathetic with every picture and every video you see. But our mission as a government is to deal with the reality. You have terrorists in Syria, they are supported by foreign powers and foreign countries, and we have to defend our country. In some areas, the terrorists use the civilians as a human shield, but we have to do our job to liberate them, we cannot say “we won’t do anything because the terrorists are holding those hostages.” It’s our mission. Again, we are going to the same point; you always have mistakes that are committed by anyone, but this is not policy, and you always have innocent victims of that war. Question 10: What kind of mistakes did the Syrian Army do? President Assad: Any individual mistakes. Question 11: Have you any examples of mistakes? President Assad: I mean, you have institutions, I mean anyone could be punished if he commits a mistake, that would happen in any war, in every army, this is common sense. Question 12: You have encouraged the civilians in the eastern part of Aleppo, and also actually the 'rebels', to leave the place. You wanted to create a humanitarian corridor. Can you guarantee the safety of those civilians and the 'rebels' if they leave the rebel-held part of the city? President Assad: Exactly, that’s what we announced a few days ago, and we announced it two months ago, because we wanted the civilians to leave away from the terrorists. Yeah. Question 13: And how are you going to protect them? President Assad: They are allowed to leave. It happened many times, in many different areas in Syria. We allowed the terrorists to leave that area in order to protect the civilians. We don’t need any more blood-letting and blood-shedding. This is one of the ways or the methods we’ve been using in order to protect the civilians. Of course, if they don’t obey, we tell the civilians that we’re going to attack that area, so they can move away from it. But the best way is to allow the terrorists to leave, and the civilians will be safe, then you can if you want to follow or chase the terrorists, you can chase them somewhere else where there’s no civilians. Question 14: Do you understand if people around the world who are watching these terrifying pictures coming out of the eastern part of Aleppo, if they maybe think that you are denying facts? That you also have some kind of responsibility for the victims, for the bombing of the hospitals, for the bombing of the civilian infrastructure? Do you understand that some people, they may think you are denying facts? President Assad: Look, if we’ve been faced by lies since the beginning of the war on Syria, accepting those lies as reality doesn’t make me credible. I wouldn’t be credible if I say “oh, yeah, you’re right.” That’s why I said there’s a difference between accepting that this is a policy, or accepting that they always have mistakes. I didn’t deny any mistake to be committed by any individual. I said there’s always mistakes. There are always mistakes committed in any war. So, I’m very realistic. But to say that this is our aim as a government, we give the order to destroy hospitals or schools or to kill civilians, this is against our interests. I mean, if you want to put the morals aside, we wouldn’t do it because this is against us, so how can those people, that would say that we are only denying facts, convince anyone that we are working against our interests? This is first. Second, if we are killing people, Syrian people, and destroying hospitals and committing all these atrocities, and we’ve been faced by all the great powers and the petrodollars in the world, how can I be President after nearly six years of the beginning of the war? I’m not Superman, if I don’t have support, I wouldn’t be here, and because I have the support, and because we defend the Syrian people, we have the support as President or as a government. This is how to refute all these claims. I mean, at the end, the reality is telling. Question 15: So, there’s a fierce battle going on in Aleppo right now. What will be the Syrian army and the Russian army’s next move to retake the eastern rebel-held part of Aleppo? President Assad: To continue the fight with the 'rebels' till they leave Aleppo. They have to. There’s no other option. We won’t accept that terrorists will take control of any part of Syria, not only Aleppo. This is our mission, and this is our goal, and this is our next step. Question 16: So, this intense way of warfare that we see right will continue, that’s what you’re saying? 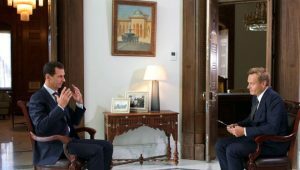 President Assad: No, if you have any other option like the reconciliations in other areas, that’s the best option, not the war, and that’s why we announced – we gave many amnesties to hundreds, and maybe thousands, not hundreds, thousands of militants, in order to save blood, and it worked. That’s why we said we give them guarantee, whether they want to have reconciliation and to have the amnesty, or to leave with their armaments outside the city of Aleppo completely, to leave the city safe, and for the people to go back to their normal life. Question 17: The United States, they stopped all bilateral talks with Russia about any kind of peace agreement, and the Russians they said that they actually regret this. Do you regret it as well? President Assad:We regret it, but we knew in advance that it wouldn’t work, because the agreement, it’s not only about the talks between the two great powers, it’s not about what they’re going to sign or agree upon; it’s about the will, and we already knew, we had already known that the Americans didn’t have the will to reach any agreement, because the main part of that agreement is to attack al-Nusra which is, according to the American list and to the United Nations list, is a terrorist group, but in the Syrian conflict, it’s an American card. Without al-Nusra, the Americans cannot have any real, let’s say, concrete and effective card in the Syrian arena. That’s why we regret it, but we already knew that it wouldn’t happen. Question 18: But isn’t it very difficult for the United States to separate the so-called “moderate rebels” and some of the more radical ones? This is very difficult, when you are attacking the moderate rebels all the time. President Assad: You are right, do you know why you are right? Do you know the unicorn, the animal that’s like a horse, has a long horn? It’s a myth. And the moderate opposition is a myth. That’s why you cannot separate something that doesn’t exist from something that exists. All of them have the same grassroots, the same grassroots that used to be called “free Syrian army” four years ago, five years ago, then it became al-Nusra, then it became ISIS. So, the same grassroots move from group to another group. That’s why they cannot separate it. And they don’t want.. if this is reality, not a myth, they don’t want, but they cannot, because it doesn’t exist. Question 19: But why did you ask them to do it if it’s not possible? President Assad: Because they insisted that there is a moderate opposition, and the Russian told them “ok, if there is a moderate opposition, please separate those moderates from the extremists,” and it didn’t work, because they don’t exist, that’s why. Question 20: What do you think will be the consequences of the US suspension of the bilateral talks? I mean, until now, the Syrian and Russian armies, they have avoided direct clashes with the US army. Do you think that there’s an increased risk of direct attacks between you and your allies and the US army? President Assad: Many people are talking about the escalation, if the agreement didn’t work or if it’s not implemented. But actually that escalation has been happening for a while now. I mean, before that agreement, let’s say, failed, the Americans attacked our forces in Deir Ezzor, and everybody knows that only one group existed in Deir Ezzor, which is ISIS, and ISIS came and took the place of the Syrian Army and they threaten the city, which is called Deir Ezzor, because of the American attacks. So, talking about escalation, it’s already happening. Talking about direct confrontation, since World War II, that never happened, I mean, it was very close to happening during the Cuban missile crisis, in 1962 I think. Now the situation is different, because in the United States you don’t have superior statecraft. When you don’t have superior statecraft, you should expect anything, and you should always expect the worse. I’m sure that Russia is doing its best not to reach that point, but do the Americans – or, let’s say, the “hawks” part or the group within the administration – do their best to avoid that confrontation, or the opposite, do their best to have this confrontation with Russia? That’s what worries us. Question 21: And talking about the incident in Deir Ezzor on September 17. It was British, Australian, US, and Danish fighter jets who allegedly attacked the Syrian Army. Denmark, like the other countries, they said it was a mistake. Do you accept that explanation? President Assad: We accept the explanation, but that doesn’t mean we accept that error, doesn’t mean we justify it. To say a mistake, maybe you have the wrong information, especially as you are fulfilling an American mission; I’m sure not the Danish, not the British, decided which target they should attack. I’m sure the Americans said “this is our target, and this is where ISIS is.” Of course, they deceive the others, and tell them “we’re going to attack ISIS.” Maybe that’s the truth. But is it acceptable for the Danish people that your army is fulfilling military missions of other countries without verifying the target and knowing where is it heading? Do you take a bus without knowing where the bus is going to? You don’t. So, it’s not acceptable. Maybe it’s a mistake, that’s true, but the mistake is not acceptable. Question 22: So do you think that, indirectly, Denmark, they were helping ISIS? President Assad: In reality, they helped ISIS because of this attack, because they killed tens of Syrian soldiers who are defending the city of Deir Ezzor from being under the control of ISIS, and now ISIS took the place, took the hills that overlook the city, so they could be able someday to take control of Deir Ezzor because of that attack. Question 23: And you think that the US, they did that on purpose, and Denmark, they helped them without knowing? President Assad: I don’t know about Denmark; I don’t know if it’s without knowing. Maybe. The only reason that makes me believe so is because the Europeans implement and fulfill what the Americans want in every field without asking and without discussing, to be frank, so it could be one of the reasons. But for the Americans, a hundred percent, they did it intentionally, because ISIS gathered their militants in the same place before the attack, and when the attack started, it took about one hour, and in the next hour ISIS attacked and took control of those hills. How could ISIS knew about this raid before it happened? Of course, this is not the only indication for us that the United States is supporting ISIS, the attack on Palmyra, when they occupied and took control of Palmyra under the supervision of the Americans, the smuggling of oil, the extraction of oil from oil fields in Syria in the desert in the middle of the day. This is a strong indication that the United States has been supporting ISIS in order to use ISIS. Question 24: Until now, the Danish government they have followed US policy towards Syria. They even said that they were willing to engage in a military operation against the Syrian Army. What do you think about the Danish policy towards Syria? President Assad: First of all, the intervention in Syria, as part of the international coalition which is actually an American coalition, this is against the international law, this is against the sovereignty of Syria because this is not in coordination with the Syrian government, while the Russian came to Syria after taking the permission of the Syrians; actually after having an invitation from the Syrian government to support us in our fight against the terror. So this is against the sovereignty, this is against the international law and this is against any moralized policy anywhere in the world. It’s illegal. The other aspect of that policy is the embargo. As part of the European Union, they made embargo on the Syrian population; tens of millions of Syrians, they are not allowed to reach the basic needs of their life. For example, you cannot buy now pumps for the water, they cannot buy medical equipment to diagnose somebody who has a cancer who would die because he cannot afford these materials. The embargo prevents the Syrian companies, airlines companies, from having spare parts for their airplanes in order to prevent those airplanes from crashing in the air and killing the passengers. This is the policy of the European Union, and Denmark is part of that policy. Question 25: But what else should they do? I mean, they are very much against what’s going on in Syria right now. They have been supporting the opposition. Maybe they don’t want to be involved in a direct war with the Syrian Army. So what else to do? President Assad: For the government? President Assad: The question is would you as a Danish citizen accept me as a foreigner to support opposition in your country with money and to tell them “go and kill, and that’s how you achieve your political goals?” If there is opposition, what is the definition of opposition? Could you accept an opposition in your country that belongs to other countries? Or should it be a Danish opposition that belongs to Danish people. They cannot tell which opposition to support in any other country. This is an intervention in internal matters. This is against the sovereignty, against the international law. They don’t have the right to support anyone in Syria against anyone. It’s not their business. We are a sovereign country; we are independent. We have the right to tackle our problems. So, they’re not in a position to support anyone, whether right or wrong. Question 26: Do you see Denmark as an enemy of Syria? President Assad: No, they are not. They are not an enemy. There is a big difference between the Danish people, like most of the European people, they were friends to Syria, but it’s about the policy of the government. It’s about whole Europe now being absent from the political map at least since 2003 after the invasion of Iraq, just because they had to follow the Americans, and they don’t dare to take their independent, let’s say, path in politics. We differentiate precisely between the government and the people of Denmark, and the same for other countries. Question 27: If it could speed up the negotiations for a peaceful future in Syria, if you left office and may be another one from the Syrian administration took over, why wouldn’t you do that? 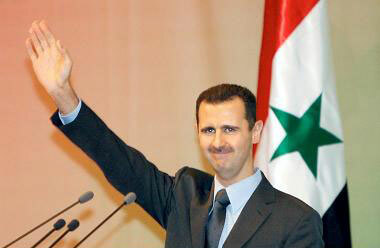 President Assad: To leave, you mean? President Assad: That depends on the Syrian people. It’s not my decision. And if you don’t have the support of the Syrian people, you have to leave right away, because without their support, you cannot achieve anything, you cannot produce anything, you are going to fail. So that’s simply the reason, especially during the war you have to lead the ship to the shore; you don’t run away because there is a war, unless the Syrian people want you to leave. If I’m the problem, again, or the other point, let’s say, or the other side of the story, if I’m the reason of the war, I would leave. But it’s not about me; I am just used as a nominal reason. It’s much bigger than that; it’s about Syria, it’s about the government, it’s about the independence, it is about the war on the regional level, it is about the war between the great powers. Syria is just the headline and the President is the main headline. Question 28: So you don’t think that you are one of the reasons for the war? 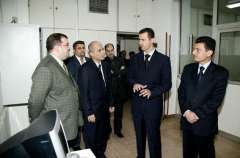 President Assad: No, I am not a reason for the war, because if I am a reason, the war should have started in 2000, since I became President, not 2011 when the money started pouring from Qatar and when the United States took the decision that they want topple governments and presidents because they do not suit them. Question 29: But don’t you think you are the reason that the war escalated? President Assad: Because of me? President Assad: So, the terrorists according to what you are saying, terrorists are not responsible, they are very peaceful people. The money of Qatar and Saudi Arabia and Turkey are something legal and natural, let’s say, and the agenda of the United States fulfilled the needs of the Syrian people, which is not realistic. Question 30: Mr. President, you have said many times that you will continue the fight until you have recaptured the whole country, is that still your approach to this process? 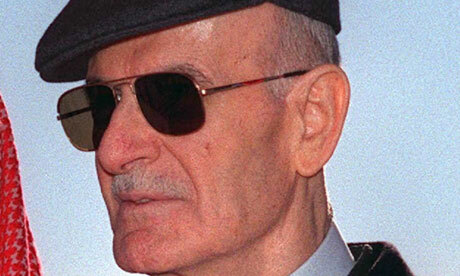 President Assad: No, it’s not my approach; it’s my mission according to the constitution. It’s the mission of the army according to the constitution; it’s the mission of the state’s institutions according to the constitution. It’s not an option, it’s not a personal opinion, and it’s not my plan. My mission is to defend the civilians. My mission is to fight terrorists. My mission is to take control of every part of my country. You don’t take part of your country as a state. You don’t say “it is enough for me have half of the country” or so. Question 31: So you think that you are defending the civilians? Question 32: I mean more than hundreds of thousands of civilians have been killed; some people say 250 thousands; some people say 300 thousands. Do you think that you are defending the civilians in Syria? President Assad: The majority of those that you are talking about, the victims, are supporters of the government, not the opposite. Another part which is unbiased, in the middle, it doesn’t belong to the government or to the other. So the majority are supporters. So, of course, I am defending the civilians. Again, otherwise if I’m not, If I’m killing the civilians, as the propaganda would promote for four years, I wouldn’t be here as President. I cannot withstand for nearly six years. Question 33: Last question, Mr. President: Do you believe in a diplomatic political solution, or do you, deep inside your heart, know that this is going to be a military solution, and that is really what you want? President Assad: Neither, neither, because when you have a problem you have a solution, you don’t have a kind of solution, but the problem itself will tell you how many aspects of that problems you have. For example, if I believe in political solution but you have terrorism, you cannot have a political solution because you have chaos. If you have chaos, this is the antithesis to anything natural, including the political process. So, you need first to fight terrorists in order to reach political solution. So, in reality, you have to follow both paths; the military and the diplomatic or the political, because they are related to each other. So, it’s not about my belief; it’s not what I believe; it’s what the requirement of this conflict to be solved. So you don’t define it. The whole circumstances define it. For example, regarding the terrorists, it’s not only about military solution; it’s about the adjacent countries and the Western countries stop supporting the terrorists. If they stop supporting them, the military aspect of that solution will be marginalized; it won’t be important because they will be weak. You will give a chance to more political initiatives in that regard. If they support them more, actually what is going to happen is the opposite; the political solution or path will be marginalized. So, it’s not about what I believe in. I wish we can solve everything politically, I wish, that’s what I think is suitable, but it’s not about what I wish, it’s about the facts on the ground. Journalist: Thank you very much, Mr. President.